Little Angel is already 2.9kg as of last Thursday (35 weeks then) when I went to see Dr. Eric. Wow...he is indeed getting big and strong. 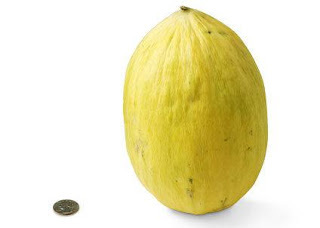 According to babycenter.com, he is comparable to a crenshaw melon in size (whatever it is!). His movements are different from what I felt last time. No more sudden punches and kicks. But instead, I can even feel him when he rolls about in my womb. It looks like waves. I guess he has little space left and thus I can feel every movement he makes now. And when he decides to give his mummy a little punch and kick once in a while, I am sure to shout 'Ouch' coz it is now real painful. I couldn't help but to post this pic below! Also look at how off-balance I now stand? My belly is getting so big that it is really difficult for me to do anything. My appetite is also growing. I seem to be able to eat more food at each meal (weird...coz my bible pregnancy book tells me that I am suppose to have trouble eating a normal-size meal). so when u coming back Pg? Girl you better eat smaller portion now if not very hard to push later . Did Eric Soh ask you to control your diet? 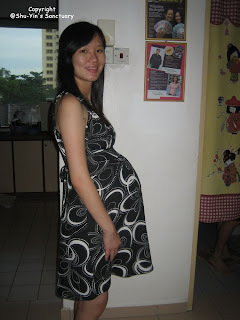 During my time, my doc ask me to control a strict diet cause very scare I have a difficult labour later. Btw, bb and me is fine now He is getting more chubby as he grow day to day. Breast feeding is still going on but quite fussy when I learn about it but I know it's good for the lil one and myself. ALway need to maintain the nutrition in it. Get more bottle to store your milk in the fridge N breast pad if you have lot of milk and ensure you have sufficient supply of maternity pad as well. There goes all the $$$ but it's worth it. elly...glad to know that u n bb are well.